Seasonal Affective Disorder (or SAD) is estimated to affect at least 10 million Americans each year. It is also estimated that another 10-20% have mild and therefore undiagnosed SAD. 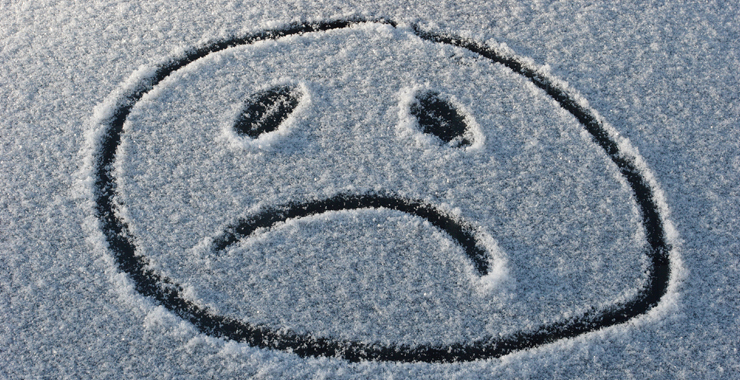 Seasonal Affective Disorder is an actual psychological depression that is connected to the seasons changing. This form of depression lasts for specific times of year, not to be confused with dealing with your in-laws! Though we do not have a specific cause for SAD, it is thought that the amount of melatonin in the body has an effect. Less daylight, especially after Fall Equinox or “Fall Back” time change, increases the body’s production of melatonin. Melatonin is a hormone, produced by the pineal gland among other locations, which regulates sleep. This means that as the daylight gets shorter, people tend to feel more tired and less motivated to stay active as long throughout the day. Serotonin levels may be another culprit for causing SAD, as well as research showing a vitamin D deficiency could cause these seasonal blues. Vitamin D can affect serotonin activity and is considered to be associated with clinically significant depression symptoms. There are a few different treatment options for SAD. These range from light therapy, to scheduling outdoor physical activities during daylight, counseling, and medication. However, there is research to suggest that CBD can potentially help some of the major symptoms of this condition. CBD is already showing relief for symptoms of anxiety and depression. A 2010 study indicated the effect of CBD on social anxiety. The brain scans of participants showed changes in blood flow in areas of the brain that are associated with anxiety. In 2014, research was published that suggested CBD has great potential as a treatment for depression while a 2015 analysis suggests that CBD is also showing great promise as a treatment for numerous forms of anxiety which is one of the primary symptoms of SAD. An increasing number of studies have revealed that CBD can potentially help to reduce symptoms associated with a plethora of anxiety disorders like PTSD. Sufferers of SAD should consider supplementing their treatment with CBD products to significantly decrease some of their major symptoms. Research shows that CBD oil causes receptor 5-HT1A, which releases serotonin, to fire more effectively. Using CBD oil for depression also impacts the hippocampus, which is a small part of the brain that impacts our limbic system. The limbic system is a system of nerves and networks in your brain which controls emotions, such as fear, pleasure, and anger. The hippocampus becomes smaller when you are suffering from depression and anxiety. CBD oil can stimulate neurogenesis, which allows the brain to create new neurons. This is especially true of CBD products with NO THC. THC is still illegal in most states, so consuming CBD products with trace THC has the potential to cause issues with your employer. This is something to consider greatly when shopping for your CBD products. Though THC has medical benefits (think pain relief, anti-inflammatory), it has been known to heighten anxiety, which is the opposite effect you are looking for when combating SAD.